UPDATED: Wed., Oct. 28, 2015, 10:57 p.m.
Washington Public Lands Commissioner Peter Goldmark used charred hillsides from the Rutter Canyon fire north of Spokane Wednesday as the backdrop to announce a $24 million proposal to strengthen state and local wildland firefighting efforts. The rapidly moving Rutter Canyon fire, which burned 150 acres in Riverside State Park in August, typifies how fire is moving out of the woods and into populated areas, Goldmark said. The fire led to evacuation notices for several neighborhoods and came within several hundred feet of a natural gas line that serves north Spokane. Because of its location in a box canyon, aircraft had to be called in to fight the blaze. Goldmark’s proposal contains nearly $7 million to train more firefighters; $6 million to thin forests around rural communities; $6 million in assistance to local fire districts for initial wildfire attacks; and additional funds for items such as equipment and aerial firefighting. The request will be submitted to the Legislature for consideration in the state’s 2016 supplemental budget, which will amend the two-year, $38.2 billion spending package adopted earlier this year. Local fire districts support the proposal, along with the Spokane Tribe and the Confederated Tribes of the Colville Reservation. Local fire districts, many of which are partially staffed with volunteers, are suddenly dealing with extreme wildfire behavior, said Jack Cates, fire chief for Spokane Fire District 9, which serves the area north of Spokane. The Rutter Canyon fire spread from treetops and raced up hillsides. 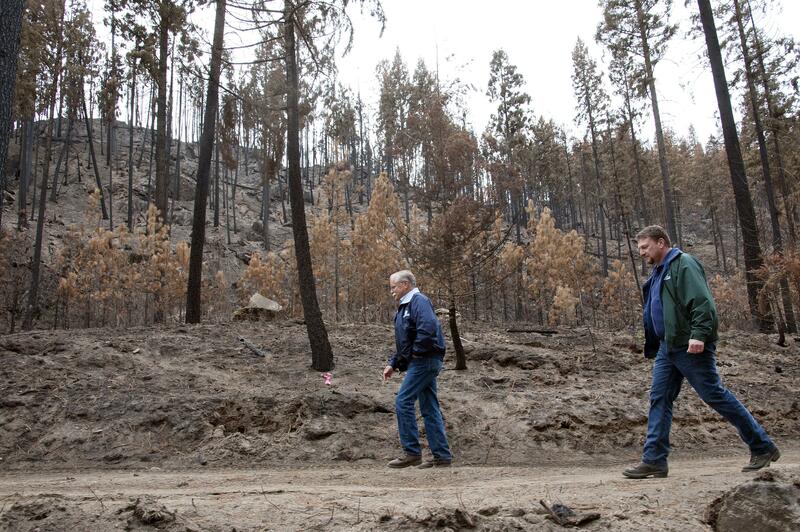 “The fire behavior was something I’ve never seen in Spokane,” Cates said. Beyond protecting homes, there are natural resources that need to be protected as well, said Mel Tonasket, a member of the Colville Tribes’ governing council. Wildfires consumed 500 million board feet of timber on the Colville Reservation this summer, and about 49 million board feet of timber on the Spokane Reservation. Timber sales make up a large part of the tribes’ annual budgets. “That’s disastrous to our economy,” Tonasket said. Fires burned more than 1 million acres in Washington this year during a season that started in May, Goldmark said. State and federal suppression costs topped $300 million, and three firefighters were killed. “That adds a lot of urgency to this issue,” he said. Published: Oct. 28, 2015, 5:41 p.m. Updated: Oct. 28, 2015, 10:57 p.m.